Spar Star MMA Event Hollywood Park | MMA Fighting Events Videos Techniques UFC Fight Picks and News. If you're in the Los Angeles area, and you're ready to catch some live MMA (Mixed Martial Arts) action, you're in luck. 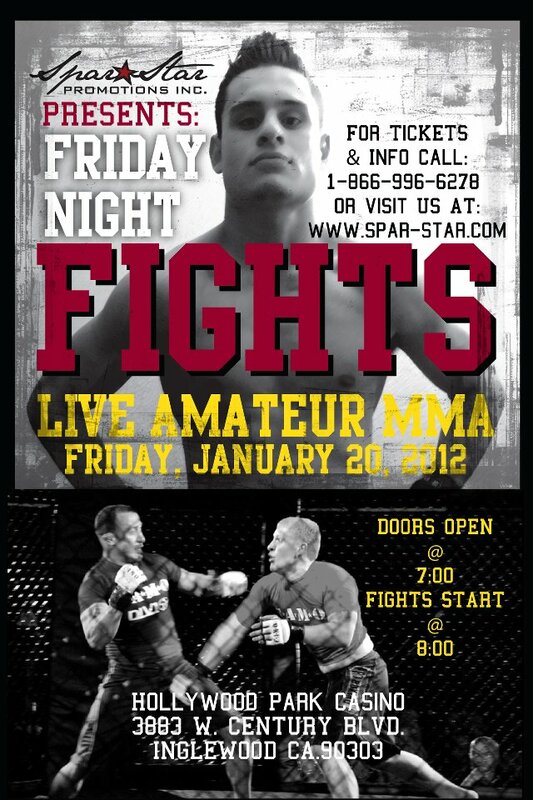 On Friday, January 20, Spar Star Promotions is holding Friday Night Fights at the Hollywood Park Casino. Hollywood Park is known for horse racing, the adjacent Hollywood Park Casino is known for poker, but on Friday January 20, it will be known for chingasos! Spar Star Promotions is one of the premiere MMA event promotions in the Los Angeles area and they have put on several successful MMA events. This one at the Hollywood Park Casino should be another good one. The doors to the Hollywood Park Casino MMA event will open at 7 p.m., and the CAMO sanctioned MMA fights get going at 8 p.m. For tickets and more info you can call 1-800-996-6278. There will be an after party after the MMA fights in the Hollywood Park Casino ballroom that will be open to the public. If you're at the fights, make sure to stick around. Check out some video of a previous Spar Star Promotions MMA event. Don't miss this opportunity to support the sport of MMA (Mixed Martial Arts) and catch a live MMA event in the Los Angeles area.